Notes: Significant elements of this series are based loosely off James Churchward's 1931 book, "The Lost Continent of Mu". In the year 2012, mysterious alien invaders nearly destroyed the entire world, or so the people of Tokyo believe. Now 2015, the people of Tokyo are stunned by the attack of forces from outside of their city. Caught in the middle of this conflict is Kamina Ayato, a young man who, like the rest of those in Tokyo, has been duped in to believing that the city around him was all that was left in the world. With help from his mysterious friend Mishima Reika, Ayato awakens RahXephon, a giant mecha with awe-inspiring abilities. Ayato then breaks out of Tokyo Jupiter, the name given to a giant dome controlled by the alien menace that encompasses the city of Tokyo and its 23 million inhabitants. Once out, Ayato discovers that the year is really 2027 and that the world outside of Tokyo is still very much alive. Together with TERRA, Ayato battles against the mysterious alien invaders (known as the Mu) in RahXephon, all the while attempting to discover what is real, what is not, and what his place is in the events unfurling before him. RahXephon is about as brain-numbingly complex as the measurement problem of quantum mechanics. Well, it isn't quite that confusing, but I doubt many will walk away from Rah feeling as if they have completely understood it. However, despite its ability to confound, RahXephon is truly superb. It bests its mecha-anime predecessors in nearly every conceivable way, while at the same time staying remarkably original. First off, the plot in RahXephon is as thick as tar. If you are not willing to commit a significant proportion of your brain cells to the viewing of this series, you might want to give up on it before you get started. But if you are inclined to contemplate this series as deeply as it often requires one to, then you are in for an extraordinary treat. This is an anime that is so good it will make you say "What the (expletive)!" The story starts off in epic fashion, with an invasion of Tokyo by invading forces. And right from the beginning the immense complexity of this series bears it face. Even in the first episode we are faced with a daunting number of evidently bizarre happenings and plot elements that will come to head later in the series. The uniqueness that begins in the first episode of this anime extends to nearly all its parts, from the function of the mecha in the plot line to the time difference of Tokyo Jupiter with that of the outside world. Also, plot twists are so abundant that you will find yourself incessantly off-balance, and it keeps this series intriguing right until the end. However, RahXephon is exemplary insofar as it is subtle, as many of the most striking facets of this tale are hidden among the more accessible portions of the series. Indeed, it is imperative that one does not even attempt to take in all that this show has to offer in the first viewing. Watch Rah once, let it simmer, and then view it again and again until you are sure that you really understand it. After that, consult Google regarding RahXephon so that you can discover just how much, or how little, of the story you really did grasp. Visually RahXephon is stunning. The animation quality is simply outstanding, particularly for a TV series. Also, the mechanical robots here are very original in terms of design, something wanting in the mecha-anime category these days. An added plus is that the action sequences are also rather well done. Additionally, much of RahXephon is focused in some way, shape, or form on music, and the music is consequently stellar. The soundscape is very mood accentuating and it helps motivate the story quite nicely. The opening theme song, crafted by Kanno Yoko, is particularly good, and has been a favorite on my playlists for months. Truly, the peripherals leave very little to be desired. Leaving even less to be desired are the characters of this series. They are, like most other portions of Rah, great. All the players are eminently likable and very easy to empathize with. Kamina Ayato, the show's lead, is very much a regular kid thrust into extraordinary circumstances, and he carries the weight of his situation admirably and without overt angst. His vulnerability coupled with his uncharacteristic strength in the face of adversity make him particularly endearing. Shitow Haruka is also a lovely character. She, like Ayato, is vulnerable and yet strong. She is also very emotional, though she often seems a bit guarded about her feelings. In fact, all the other characters of RahXephon are similarly marvelous. All of them play the roles intended for them in distinguished fashion. The only reason why anyone might not love this series is that a good deal of people seems to think this series is reminiscent of Neon Genesis Evangelion. Rest assured, the similarities are only skin-deep. In my view, Rah is Eva done right. For instance, the characterization in RahXephon is much stronger than that of Evangelion (the angst is severely toned down for example). Also, Rah has a conclusion that is many times more satisfying than that of Eva, in which we are rushed to closure in a somewhat contrived and unsuitable manner. 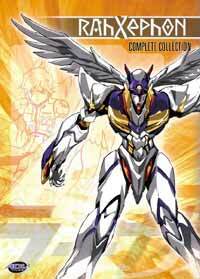 Beyond that which is superficial, RahXephon is quite distinct from Neon Genesis Evangelion. However, both series are powerful and elaborate. If you liked Eva, you won't find fault in RahXephon. I can honestly say that it isn't often that I enjoy an anime series as much I enjoyed this one. This is one of those series that is powerful, intellectual, and beautiful at the same time. In conclusion, RahXephon is, in my humble opinion, one of the greatest anime ever, a sublime experience that is rivaled by very few existing titles. Recommended Audience: Complex and graphic at times, this series is not one to be watched by young children. Appropriate for those thirteen years old and up at best.